KUCHING: Sarawak author Margaret Lim has been nominated for the prestigious Astrid Lindgren Memorial Award 2008, the world’s largest award for children and youth literature. She is the only Malaysian on the list of 155 candidates for the award, which offers $5mil Swedish kronor (RM2.6mil) in prize money. Lim, 60, was thrilled that her nomination had been accepted, even though she will be up against some big names in children literature such as illustrator Quentin Blake and writers Jacqueline Wilson and Diana Wynne Jones. “The very thought (of being nominated with them) makes me quake. It is very kind of the award committee to consider me, practically a nobody, on the list of candidates for the 2008 award. 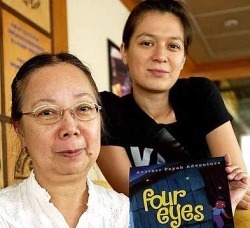 Talented duo: File picture of Lim (left) and her daughter Buchheim at the launch of ‘Four Eyes’ in Kuching last year. Buchheim has also been nominated for the award. “At any rate, Sarawak is on the literary world map and I am very proud to represent Malaysia,” she said in an e-mail interview. To make it even more special, Lim’s daughter Su Jen Buchheim, who has German citizenship, was also nominated for the award. Both of Lim’s children books, Payah and its sequel Four Eyes, were illustrated by Buchheim. “Payah and her friends are as much her creation as mine. I never described any of the characters physically; she made them come alive with her brushstrokes,” Lim said of her daughter’s illustrations. Lim is currently putting the finishing touches to her third Payah book, Precious Jade and Turnip Head, which will be published in November. She has also finished working on the fourth, Nonah – The Ghost of Gunung Mulu, due for publication in 2008, and completed a children’s play called Jump! Bilun! Jump!, about a mouse deer trying to outwit a crocodile. Married to a German dentist, she divides her time between Germany and Malaysia. The winner of the 2008 award will be announced in March.